The Dynamics Explorer (DE) mission's general objective is to investigate the strong interactive processes coupling the hot, tenuous, convecting plasmas of the magnetosphere and the cooler, denser plasmas and gases corotating in the earth's ionosphere, upper atmosphere, and plasmasphere. 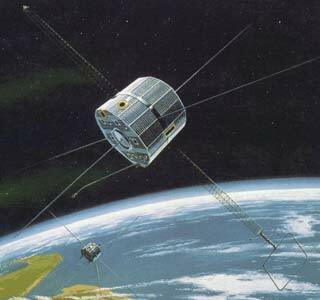 Two satellites, DE 1 and DE 2, were launched together and were placed in polar coplanar orbits, permitting simultaneous measurements at high and low altitudes in the same field-line region. measurements for significant periods along a magnetic field flux tube. The spacecraft approximated a short polygon 137 cm in diameter and 115 cm high. The antennas in the X-Y plane measured 200-m tip-to-tip, and on the Z-axis are 9 meters tip-to-tip. Two six-meter booms are provided for remote measurements. Power is supplied by a solar cell array, mounted on the side and end panels. The spacecraft is spin stabilized, with the spin axis normal to the orbital plane, and the spin rate at ten plus or minus 0.1 rpm. A pulse code modulation (PCM) telemetry data system is used that operates in real time or in a tape-recorder mode. Data have been acquired on a science-problem-oriented basis, with closely coordinated operations of the various instruments, both satellites, and supportive experiments. Data acquired from the instruments are temporarily stored on tape recorders before transmission at an 8:1 playback-to-record ratio. Additional operational flexibility allows a playback-to-record ratio of 4:1. The primary data rate is 16,384 bits per second. Since commands are stored in a command memory unit, spacecraft operations are not real time, except for the transmission of the wideband analog data from the Plasma Wave Instrument (81-070A-02). On 22 October 1990 science operations were terminated. On 28 February 1991 Dynamics Explorer 1 operations were offically terminated. The DE 2 spacecraft (low-altitude mission) complemented the high-altitude mission DE 1 and was placed into an orbit with a perigee sufficiently low to permit measurements of neutral composition, temperature, and wind. The apogee was high enough to permit measurements above the interaction regions of suprathermal ions, and also plasma flow measurements at the feet of the magnetospheric field lines. The general form of the spacecraft was a short polygon 137 cm in diameter and 115 cm high. The triaxial antennas were 23 m tip-to-tip. One 6-m boom was provided for remote measurements. The spacecraft weight was 403 kg. Power was supplied by a solar cell array, which charged two 6-ampere-hour nickel-cadmium batteries. The spacecraft was three-axis stabilized with the yaw axis aligned toward the center of the earth to within 1 deg. The spin axis was normal to the orbit plane within 1 deg with a spin rate of one revolution per orbit. A single-axis scan platform was included in order to mount the low-altitude plasma instrument (81-070B-08). The platform rotated about the spin axis. A pulse code modulation telemetry data system was used that operated in real time or in a tape-recorder mode. Data were acquired on a science-problem-oriented basis, with closely coordinated operations of the various instruments, both satellites, and supportive experiments. Measurements were temporarily stored on tape recorders before transmission at an 8:1 playback-to-record ratio. Since commands were also stored in a command memory unit, spacecraft operations were not real time.